What are your thoughts on getting rid of "excess" children’s toys to make room for stash? I’m asking for a friend (me). You know, there’s a lot of evidence to support the idea that children do a little better with a little less. For the purposes of you getting more room for stash, I have decided not to extend this argument logically to adults and their toys. Has anyone really thought about this all jibber jabber about tidiness? Why do people feel they must limit their stuff if it is stuff they enjoy? Why are we conditioned to feel guilty when we have a lot of stuff? Is the Tidy Bully standing over our heads with a whip? So many rules! So many shoulds! As long as it is neatly kept, why can’t we just keep stuff until we need to use it and let it go when we don’t need it anymore? I couldn’t agree more with Bonnie. This is my stuff, I’ll have exactly as much as I want to (provided that’s been reasonably negotiated with the other people who live here…) and I don’t feel very guilty about it at all, and I don’t think anyone else should either, as long as you’re not running out on making the mortgage payment because the alpaca habit reared its ugly head. I do feel compelled to point out that Bonnie makes another excellent point though. "As long as it is neatly kept…" and we’ve all got a different definition of neat. My stash needs to stay under my threshold. Yours too, I bet. Did you see one of the recent Hoarders where the woman refused to let them take her 10 Large moving boxes of packed yarn? I was dying to know what kid of yarn she had in those boxes. I didn’t see that one, though my heart might have bled a little for her, depending on what else was going on in her home. Like anything, there is such a thing as too much yarn (I can’t believe I just typed that) and I guess it’s possible for it to hit pathological levels. If you’ve filled the bathroom with merino and are now showering with the garden hose year round, you might be there… or like I said above, if your stash is now taking up unreasonable space that belongs to someone else… well. That might be fair too. Mostly though, I think that while yarn collections are poorly understood by …. frankly, everyone, if you’re on Hoarders, you might have too much – but yeah. I still want to know what was in those boxes. What the heck is Sock Camp, and why should I care? Well, whether or not you care is totally up to you, and it’s really hard to describe what Sock Camp is. Mostly, it’s a dyeing/ knitting retreat. Mostly knitting. Technically it’s four days at the Resort at Port Ludlow, with two classes of knitting instruction (one with me and one with Lucy Neatby, who’s practically a legend) and one class of dyeing with Tina, where we turn a whole sunlit room on the water into a dye studio, and you splash dye around (with some help) and make deeply personal yarn – and this year the fourth class is one I love. It’s with Carson Demers, and he’s a knitter and a physical therapist, and he has a special interest and focus on how knitters can knit in a way that will keep them knitting, injury free – for a lifetime. He’s bloody brilliant. You take a focused class in the morning, then in the afternoon there’s either a bonus thing (this year we’re going out whale watching) or a workshop. (This year one of the workshops is a clinic with Carson, where he’ll critique and work with each knitter to help them in a personal way – in addition to the general class.) There’s also amazing food, every room has a whirlpool bath and a fireplace, and in the evenings we do some pretty amazing stuff. There’s the talent show, and homework presentation, and you should ask around about the slide show. It’s amazing. Mostly though, it’s hard to explain. It’s four days in an intimate setting with other like minded people, in a luxury resort, talking about knitting with other people who really, really care about it the way you do. People make friends there they keep for years, and Tina and I love meeting them in an small setting like that. There’s the sea, and otters doing disgusting things (I can’t hardly talk about that) and knitting on the veranda with a glass of wine, if that’s your thing. I love Sock Camp. What’s with the theme? Do I have to dress like a pirate or wear a hat? I hate hats. Yeah, me too. I won’t be dressing up either, though I can’t speak for the other tutors. It’s a deeply personal choice. I suppose the theme is mostly for "guidelines" (to quote Captain Jack Sparrow) and it does add a layer of fun. (Like the pirate theme was the spark for going whale watching.) Really though, it’s just a knitting retreat. Nobody wants you to talk like a pirate or dress funny – unless that really makes you happy. Then go ahead. Remember that when Tina wears her hat. I don’t think I can stop her. What’s the difference between Sock Camp and the Knot Hysteria Retreats? Which one should I come to? I think I’d rather come to a retreat because I don’t care about socks that much. What’s the difference? Minimal really. The Knot Hysteria Retreats usually have spinning, this doesn’t, and the Knot Hysteria retreats are free-standing and just the way Tina and I want them to be. Sock Camp is run by Knot Hysteria (The company Tina and I own that runs Retreats and Sock Summit) but technically, that company is hired by Blue Moon Fiber Arts (Tina’s company) to run it. That means that it’s way more Tina flavoured than usual. (If you love her as I do, that’s a good, but wacky thing. Definitely wacky.) All the other stuff is the same. As for not caring about socks, I get that, though two points. First, like we said about Sock Summit, socks aren’t really socks – they’re tiny canvasses to practice general knitting skills on – so we think they’re really interesting. Second, for this Sock Camp, there’s only one truly sock specific class. (That would be mine, but you know how I feel about socks.
) Lucy, Tina and Carson’s classes translate really, really well to general knitting. They are simply presented by way of sock. I can honestly say that I’ve never known anyone to be lonely at camp – unless they wanted to be. You’d be surprised how fast you’ll make friends. Even if it’s only me. Sock Camp is too expensive. I know it’s expensive. for a lot of us, it’s too expensive. (The irony is that if Tina and I didn’t run the things, we wouldn’t be able to go either. We get it.) It’s a knitting retreat/vacation at a resort. There’s a chef, and lovely staff, and knitting teachers that we’re committed to paying a fair wage to. That makes it expensive. I think there’s no point in denying that it costs a lot, so I think about it like diamonds, or cashmere, or owning a really posh car. It’s a treat – and not everyone can afford to treat themselves like that. I wish it was less expensive, but just like cashmere, it isn’t. If I could make it less expensive, I would, but it’s just not how luxury retreats work. There’s other retreats, ones where you stay in a cabin, or whatever, and some of those will be closer to the reach of more people, but the truth is that it’s like going anywhere really, really special. If you can afford it, and you love it, and it’s important to you (and it really needs to be all three) then you do it. Or (like me and Paris…) you think about it all the time and save, and hope someday it could change, or that I win the lottery and invite you all for free, which I totally would. Is there still room at Camp? -You, know that I’ve told you all this. A little, not a lot. Go here. Hit Register. and I’m onto the batts I made with Judith, which I can only hope I do justice to. Yes, when are you coming back to the UK?! I wish I could go; I’m glad for all those who get to. Someday… And someday I have to meet Tina in person too. Since you asked if there were anymore questions. May I, at least mentally, reclaim the yarn in your not up to snuff projects youll never finish? Someday I will be there – beautiful location and obviously great people! It does feel like spring though, so I can deal with my pain!! We never got to see your braided hooded cardigan made from Jarod’s Shelter. Still hopeful you will tell us all about his yarn. Sock Camp…I have three major savings funds…two for kids’ college, the other for Sock Camp. Someday! In the meantime it does feel wonderful outside. I brought my knitting to my parents’ house over the weekend and chatted with my mom on the patio while working on a blanket for the baby-in-progress. That would also be the college fund #2 baby. Yes – when are you coming to the East coast? It would be much less expensive for us Easterners to fly you & Tina here than for all of us to go out there. Last night I was looking through my yarn and the fluffy batts caught me eye. I could fit a bag of yarn in the same space as some nice fluffy batts. So I dusted off the wheel and spun. It wasn’t until I was trying to explain my motivation to my husband that I realized I was mimicking your blog. oh well, I have a funky skein of handspun and a forgotten merino/silk/nylon batt started. Thank you for providing motivation. I asked about the spinning, but it might have been only in my head. I love the spinning pictures! More pls. How do you also spin like the wind? Beautiful. Sock Camp is more fun that anything should be. It is totally worth saving up to attend once a year or every other year. As for Spring…carefully, we had snow here in Portland this morning. Didn’t seem to faze the crocus though. Since you are on a tidy kick, if you need to get rid of any of this beautiful handspun yarn that you have created over the last couple of days, I will gladly take it off your hands—-I am NOT in a neat mood right now!! I love your post about tidying up! After reading it I felt a strong urge to wash the winter grunge from my windows and sills. So I sat down and knitted until the urge went away! I also love when you answer the questions in a general way. Someday I might get to go to one of your retreats. For now I’ll keep knitting those cleaning urges away! Also, I went to a Knot Hysteria retreat. It was a fabulous, once in a lifetime experience. So of course I’m saving up for another, hoping for a color retreat redux in summer. Is it too much to hope for? So glad I’m not the only one spring cleaning and waiting for the Big Smack of Snow we know is still coming! I love question and answer posts! I’ve just done a great deal of spring cleaning too. I also truly believe we are going to get one big snow storm (in New England) before spring really hits. Some day, when the college bills are paid, I’m looking forward to going to Sock Camp. I would love an east coast version of sock camp, as Jane in PA mentioned at 4:12… Are we allowed to vote? So, what you’re saying is: as long as I can still meet all my financial obligations, and as long as I can pay cash-money for it (i.e. not go into debt for it), then I can buy a new bike? I only ask because you have touched on the topic of having stuff, and also because I think it would take Suze Orman too long to get back to me. NOW I know why the gansey isn’t being finished. Someone else isn’t finishing his job first. Gotcha! If Cindy H is asking about the episode of Hoarders I think she is, I believe all the other yarn that could be seen behind people while they were cleaning was Red Heart. So, I just guessed that the packed boxes were more of the same. The one episode that got me was when they convinced a knitter she didn’t need all the needles she had. At least needles are reusable and her collection of them didn’t look any more crazy than mine. my question: you need some help unloading all that lovely spinning? I have a question!!! Me, Me, Me! Pick Me! Please oh please will you tell us where to buy that wonderful pattern for the baby blanket you recently made? It is so beautiful, I want to share it with a baby too! Well since you’re asking, when are you visiting Australia, our winter is like your spring…. just saying we have retreats here too. Gosh Stephanie, that spinning is amazing. The perfect colours for an Autumn shrug. for my oldest, and I’m trying to convince my second daughter to pick “Owls”! I join others in asking if I may also take some of that yarn you just spun off your hands… all of it made in my favorite range of colors… pretty please? About children and less stuff: one Christmas one of my children got to the bottom of the pile of stuff from grandparents (mine are the only grandchildren) and others and asked, “Is that all?” I was horrified. After that I imposed a rule: one gift per child from any person (books don’t count), both Christmas and birthdays. They had to think about what they really wanted and became far more appreciative as well as decreasing the amount of stuff. And I can use the Christmas stockings to fudge the gifts a little bit… after all, I’m the mom, it’s my rules :-). It’s one of the best things I’ve done as a mom. not a question – just a comment – wish I could go to sock camp. It sounds like soooo much fun… maybe one year…. My family has a tradition of spotting the first robin of spring. Does Canada get robins and how early in the year do they arrive? Really it is just about setting family priortites, sending children to college or attending a dream retreat. Unfortunately college is winning. My priorities are not alway the same for the rest of the family. Did you see the Hoarders (or maybe similar show) where the therapist was trying to tell the victim (hoarder) that she had too many needles? “Why do you need to have them in all the sizes?” she asked. She had a lot of other stuff, but her knitting stuff didn’t look all that bad – it was a shoebox of knitting needles. But I agree, an hour of Hoarders works wonders in my level of tidyness. Mmmmm–that red on the bobbin, mmmmmmm. We have glorious places with good chefs and amazing retreat space right on the short of Lake Superior, which is kind of like being on the ocean. Minnesotans and Wisconsinites and other Midwesterners knit a lot, so lots of us would come. Do hints work? We are moving into autumn here in Australia and the mornings are cool and crisp. The golden orb spiders are spinning their webs and getting fat and looking beautiful. I am also spring cleaning so maybe it should be ‘change of season cleaning’. Your comment on the previous post about giving away yarn that no longer speaks to you prompted me to move a bunch of yarn from my Ravelry stash to the Trade/Sell tab. I realized that as much as I may have loved some of it at the time, it doesn’t fit into anything I am going to knit ever. Thanks for the little push. I must say that I love the red on the bobbin! Socks are my mini canvasses that I attempt new stitches and new techniques. Of course I fully acknowledge that i’m just this side of crazy. I’m also going to second Jane of Lancaster County PA; Great beer, Great people, and Great Food. Besides, my favorite LYS has local artists selling in her shop. I may have totally missed it… But I’m still really wanting to know how/where you got the yarn to finish Luis’ baby blanket. Because someone else broke the ice, I’d also like to ask about the steel wool you bought a while ago because you thought it was the most beautiful thing you’d ever seen made up. It gave me cold chills, but I’d really like to know if you made it up and if you did, do you wear it? Not a question. Just wanted to note that my desire to change my name to Denny has increased while you were spinning. While you were spinning. Now that’s a movie I’d want to see…. Irony – when i signed up for Sock Summit, I thought it was more like Sock Camp. I was a little disappointed by the enormity (and resulting impersonal-ness) and, while I learned many great things, kind of wished I’d gone to Sock Camp instead since that is more my size. But, I have other plans this year, so can’t go to Sock Camp and now that makes me happier that at least I could go to Sock Summit. Is that weird? I just love seeing the gorgeous yarns you create!! (I couldn’t think of any question). Okay, Steph, here’s the question—how in the Sam Hill do you have time to do all of the things you manage to get done??? Do you have some special voodo thing with time that gives you more hours in the day than the rest of us? I sit at my computer overcome with awe and amazement when I read about all you accomplish….share your secret….PLEASE??!! Yes! I have a question! When’s the next KH retreat? For Xmess I told my Mum I’d sponsor her next retreat (as long as I get to go too) so we can have another mum / daughter week. It’s only March, but I’m sure she’ll come sniffing around for that present soon. I have a question… I know Knot Hysteria is usually in November, but have you and Tina set an exact date for it yet? In truth I’m a knitter who is blind and I also spin. Wouldn’t it be fun to have a blind folded sock knitting challenge at sock camp? Lol. I’m making fun of myself a little bit but in all seriousness it lends another form of appreciation to knitting and spinning. Ps. I’ll get to sock camp or knot hysteria one of these days. Beautiful yarn! I do enjoy seeing what you create. Now, if I could find my size 4 dpns, I’d be in business! I have a repetitive stress injury (partly knitting, partly 20+ years of computer work). I wonder if I could convince my insurance company (also happens to be my employer) to foot the bill for sock camp? Yeah, I didn’t think so. :-/ Another 6 months and I might have been able to afford it, but alas, next month is not meant to be. Any chance that Carson has some tips or classes online (whether free or paid)? December/January in Sydney (Australia) are supposed to be 40C, and we have had rain, rain, more rain, and 17C days. You’ve had a mild winter. This confirms my suspicion that our our Summer went on holiday to Canada this year. Love all the spinning. I’m going to wrestle back Thursdays for Guilt-Free Craft Day, very soon! I miss my wheel…. Will sock camp ever happen during the summer? Otherwise I have to wait until everyone is out of high school and/or the husband travels less for work. I’m nervous about leaving 2 teenagers to run the asylum. I would love to go to Sock Camp. Sadly, I have to work then. I am a teacher. So you need to keep having sock camps until I retire in about 5 years, or have them in the summer. Because I love to talk like a pirate, knit socks and at this stage in my life have NO qualms about talking to people I don’t know, I think camp and I were made for each other! Oh no I am so scared right now, reading this entry – oh, I hope this isn’t tempting the gods!! I live in central New York and am loving this weather…but at the same time I am so scared – everyone keeps talking about the year we had a blizzard on Mother’s Day. Please go out and do a dance or something! I don’t dare say it is spring until the end of May at least. PS also feeling the urge to tidy, garden, rip the insulating plastic from the windows and throw them all open – yea! Oh please don’t snow again………….. I love reading your blog..especially yesterday’s. Someday, I’d love to come to Sock Camp. But this April I’m taking 2 classes with Lucy at the Midwest Masters. It was on my Bucket List and I’m going! I feel very lucky. Plus I’m going to a Knitting Retreat weekend with some members of our knitting guild soon after. And I don’t have to travel more than 200 miles for either. Our guild is very enabling. That last singles is just beautiful. You do justice to Judith’s batt. I’m finally trying out the batts I made at Knot Hysteria, the first batts I’ve spun from. Now that I’m trying to process them, I think I have a better idea of what I should have done. I’ll admit that it was a matter of throwing different colors at the carder with no thought beforehand of what I wanted to make. Actually, I was thinking of the batt as the end result, then. That yarn… want… need… so beautiful. 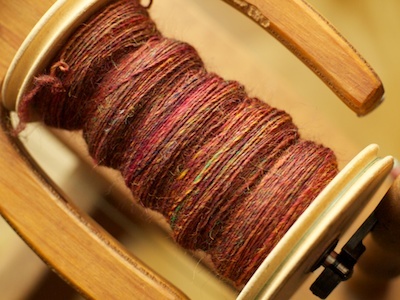 I love watching what your spinning creates. Also, sorry about berated you about the Gansey. Thanks for the back story. I look forward to seeing it, all in good time. I think you and Tina are quite clever to have created sock summit and sock camp. Those who can go get a wonderful blessing and amazing experience. Oh my goodness that yarn is gorgeous. I am so glad I am only seeing it in your post, and not in a yarn shop, where I would certainly have to purchase it. Thanks for the vicarious thrill. And thanks, too, for the enabling post about letting go of previously loved yarn. So much to knit, and so little time; one must prioritize. Oh no, the suspense is ruined. Joe’s gansey isn’t done? I’ve been reading from the beginning and just finished March 2006 when you were lamenting how long it was going to take to spin the yarn. I’m sure I’ll enjoy every minute of reading about what happened between now and then with the gansey, or lack thereof. Wish I could make it to Sock Camp, but the stash demanded additions of MadTosh and cashmere from Stitches West and thus left no funds for Sock Camp. Even though I’m into sweaters more than socks, I loved this year’s Sock Summit, especially Fiona’s class. I wish I had been reading your blog before the summit and had known that I was in the presence of the Yarn Harlot. Glad to hear the gansey reason is so simple. I had it worked up in my mind to some sea-faring superstition that had to do with the reason initials are knitted in, and what having a sweater with ID might mean and wanting to avoid jinxing your Joe. Reply to Anna (5:39pm): We certainly get robins in Ontario, but some stay here all winter, depending how severe the weather is. A more dependable sign of Spring is the arrival of the Turkey Vultures, and I saw my first three of the season yesterday. I used to send ‘Happy Spring!’ cards with vultures on them, until I was told they really freaked people out. People can be so weird. YES! Are you still emailing responses to TSF/KWB donations? If I’ve emailed you about a donation should I expect the slightest response? What about if I emailed you in August 2011? About yarn and Hoarders (as on TV). NO one gets on that show just because they have too much yarn and multiple knitting needles. People who collect yarn also collect scrapbook supplies, beads, paper, and other craft items as well as clothes, garbage and on and on. Every show I’ve seen with yarn issues the yarn has been inexpensive synthethic yarn. It is always unorganized and often it has mouse poop on it too. I’m waiting for the show where the organizers find the stash of alpaca or merino and fall into a surprise trance over its softness. And then they find the handpainted yarns. 2. Also for Joe: What, exactly, do you have to do to get her to finish your gansey? Will you post a video of it? 3. For Mademoiselle Millie: How do you resist playing with or cuddling in all that yarn? What advice would you give other felines faced with enough stash to yarn-bomb the CN Tower? 4. Hank, how many lizards did you try to bring home from the Caribbean? Just like last summer, Toronto’s warm weather has come from the dip in the jet stream that has not treated the Pacific Northwest to the same weather. Unless things improve here you better keep those fingerless gloves and sweaters handy for Port Ludlow. We had SNOW today. We hardly ever have snow, even in winter. Excuse me, time to put another log on the fire. You told me the name of a book before, when I had asked you about plying singles with a drop spindle. I lost the email that had the name of the book, could you please tell me the name of the book again? I’m sorry to be a bother. Dear Stephanie, when you are old and blind and arthritic, won’t you prefer to have a Joe in a lovely gansey to snuggle up with, rather than a knob? (That sounds a bit odd, but works in England, I truly hope I haven’t offended any North Americans). Finish the Gansey and put Presbytera out of her pain. This probably reveals more about me that I should, but the quote wasn’t by Jack Sparrow, it was Joshamee Gibbs, and then re-quoted by Elizabeth Swann!! And when I’ve won the lottery I’m comeing to Sock Camp. Yes, please. One more question and a comment. Would Sock Camp be horribly inappropriate for someone who is painfully shy and knits v e r y slowly? You were planning to make a vest for one of your daughters. I believe it was Flourish. Did you make it? If so, does she wear it? OMG! How do YOU get away with making reference to AWESOME research about kids and toys??? HUH? Four years I did daycare – FOUR YEARS! I interviewed SO. MANY. PEOPLE who told me I didn’t have enough toys for their kids to play with! REALLY? I was a food allergy caregiver who believed in lots of fresh air and whole food diets. I ONLY took kids with food allergies because my son has a peanut allergy and looking for childcare was a nightmare and we didn’t like centers. I would so do it again if my house was about 500 sq. feet bigger and I could find parents in this city with food allergic children who can’t find daycare BECAUSE of the food allergy and who are totally fine with excursions and less on the ABC’s since children sit far too much now anyway. Isn’t that what childhood is supposed to be anyway? Playing and having fun? I just was so thankful you linked that article because I was beginning to think I was a bad parent because I don’t think like other parents do. That article and this portion of your post has vindicated me after years of ridicule from other parents about how I put my son in danger letting him out without the bubblewrap. I didn’t see the Hoarders episode with the 10 boxes of yarn, but I did see one where some organizer moron told the poor woman that she had 5 sets of knitting needles, and that was really too much and she didn’t need but one pair, so was she willing to give up 4 of them? The organizer bully cowed that poor woman into giving up all but one pair. Now really! It clarified any illusion I might have had that those organizer people knew what they were doing. 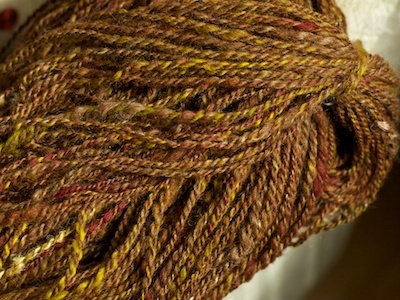 Wow, that “reddish” batt turned into some really nice yarn. Did the colorway kinda surprise you? I’m surprised! Yes, Sock Camp sounds like a blast. No, there’s no way I can a) afford it or b) get the time off work. *Le sigh…* Oh well, WWKIP is coming soon, and costs neither vacation time nor $$. Thank you so much for linking Carson Demers in your blog today. He had not posted in ages and when I checked out his blog he had a post regarding De Quervain’s Tenosynovitis and prevention tips! The timing could not be better! Bless you Steph! And I want to see the hoarder’s yarn too. How’s the post Christmas vest you were making for your daughter coming along? You know we love pictures! Now I have a real reason to buy lottery tickets. Hope the Hubby understands. Sorry for the double post. My computer took a nap while I refilled my coffee cup. When I got back I thought I forgot to hit the “Post” button. Hope it isn’t a sign of how the day is going to be. Thanks for the endless food for thought, as well as the beautiful knitting and spinning. Unrelated question here. I read somewhere that you’re also a lactation consultant, I was wondering if you have any good tips about how to knit while nursing a 5 month old baby. Uh-oh. Just saw this post. It’s one thing to poke you, Steph — but if I’ve been poking a stick at Joe with every mention of the gansey, then I most humbly apologize to him. I agree with Jane in PA…when can you come to the East Coast…or at least somewhere within a days drive of Central Kentucky! Thank Goodness you are much younger than I because by the time I don’t have to worry about leaving work in April you’ll probably still be holding Sock Camp and I can go!!! East coast? East coast of Australia perhaps? I could afford that from Perth. lol Until then I can dream and pretend I can afford to jet over to Canada for a weekend @ Sock Camp. My questions are asked by various voices above: 1) Where did you end up getting the last ball of yarn for Luis’s blanket? and 2) Can we please ever see a picture of you wearing Gwendolyn? Ask a question, get a question! One of the marvellous things about knitting is that you can do it with almost no budget at all when one is poorish and scrimping, knitting with budget yarns and stuff from thrift stores, and you can create lovely things. You can also be the knitter with the unlimited budget who goes to the conferences and retreats and buys the deluxe yarn. Many poor knitters will find them selves less poor in their futures. And by funding the events, richish knitters let the teachers develop the cool ideas they share with all of us on blogs and in books and magazines. I can’t justify spending what it costs to go to Sock Camp, but I do get to do other fun things I never thought I’d do. Sock Camp is not too expensive for what it is. It is more than I can spend, but that doesn’t necessarily mean it’s not a fair price for what’s included. On the other hand it would be helpful if you gave some vague idea on the info page as to how much to expect lodging to cost. It would be hard for me to plan and commit to spending that on the camp with no clue how much additional cost there will be. The Sock Camp sounds wonderful, but I love Squam. It is hard to choose when there are so many interesting choices, especially because funds mean that you can only choose one. When you say “alpaca habit”, you mean fiber and/or yarn, right? Not actual alpacas. Because I just can’t say that I’ve ever seen one with an ugly head. . .
Ha! Love that the gansey is kinda being held for ransom! I am a bit envious that you can knit for your husband: the fates laughed when they had my husband and I meet 20+ years ago! The man is a furnace. To date: 1 pair of socks, 1 hat. Never worn. Love your blog, keep up the fantastic work! Yes, when are you coming to Ohio, Indiana, Kentucky? We would love to have you talk. Also, why don’t you do a sock camp on THIS side of the country? We would love one in the midwest/ eastern part of the country. I am sure there are many lovely resorts that would be willing to have sock knitters take over. I could think of 3 or 4 in Ohio. THAT CUTE SIMPLE GRAY AND WHITE BABY SWEATER…could you please give us a math recipe for it…not a whole pattern really…just how the yoke increase happens…top down? I just, for the first time, read all of the questions. If I were you Stephanie, I would change my name, move far into the woods, write under a pseudonym about what it is like to have 100s of unruly children and when they ask me if I finished a vest, a gansey, a jacket, I would tell them all MYOB (Mind your own business). One of them wants you to set up a yarn lottery where people could buy tickets, (thousands!) and you could choose a winner for a bit of hand woven yarn. I personally couldn’t cope with this mob, but maybe its because I am an old person. I dunno. I do wish you well and wouldn’t ask you a question for anything. Cheers! A Neighbor to the South! I have been resisting the urge to learn to spin. My husband is going to freak when I bring home a wheel. But your pictures with the beautiful yarn-fibery goodness makes me want to run off to a class as soon as possible. I LOVE them! Thanks for sharing with us. Oh dear..I really want to go to sock camp! As I would have to travel from Norway, I might have to stick to reading about it. But it soundS so lovely! I might start my own knitting camp! PS: as you’ve written before about owning a great amount of yarn: you need a partner that can axept it. My husband just carried six ginormous bin bags full of yarn when we moved. And not a single complaint. I don’t want to tell him I’m grateful about it, in case he would change his mind about it. But seeing him carrying the bags, it made me love him a bit more! Any chance any of the camps are considering coming down south? North Carolina has amazing spots both throughout the blue ridge mountains and on the outter banks…..